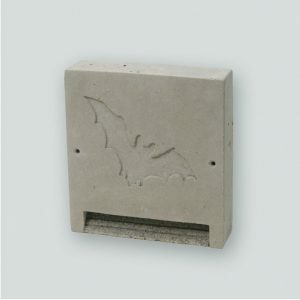 The 3FE Bat Wall System is intended for building-dwelling Bats (including Pipistrelle and Serotine Bats, Barbastelle Bats and Natterer’s Bats, etc.). Thanks to the modular and flexible concept, many of the typical special solutions for sub-optimal façade design are covered by a standard solution, e.g. 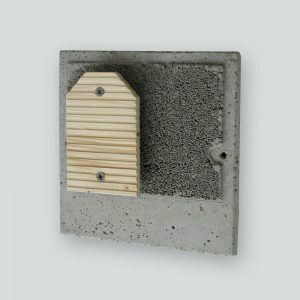 ability to enter existing roosts, small installation depth available, avoidance of thermal bridges despite smaller installation depth, required drip edge in case of water flow on the façade, etc. The design and installation work, costs and logistics are therefore optimised significantly. The outer section (see Fig. 1, 2, 3) is the actual crevice roost and is open at the rear. Inside there are two separate hanging zones which taper upwards. Below that there is a deeper hanging area. The inside has an especially optimised surface structure. 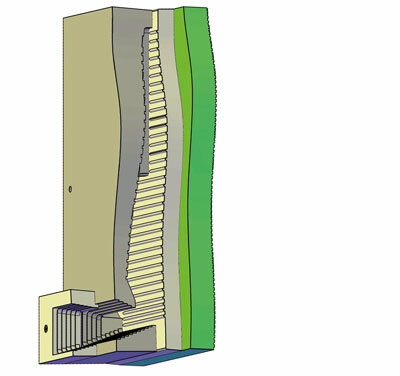 The outer section can be screwed directly onto the façade (see Fig. 2A). The surface of the façade (e.g. render) then forms the rear of the roost. It is advisable to seal the contact area, e.g. with acrylic. However, in most cases the outer section is set into the façade (e.g. glued or bricked in). The surface of the 3FE can then be rendered or be left unrendered, for example, if it is installed in fair-faced masonry. 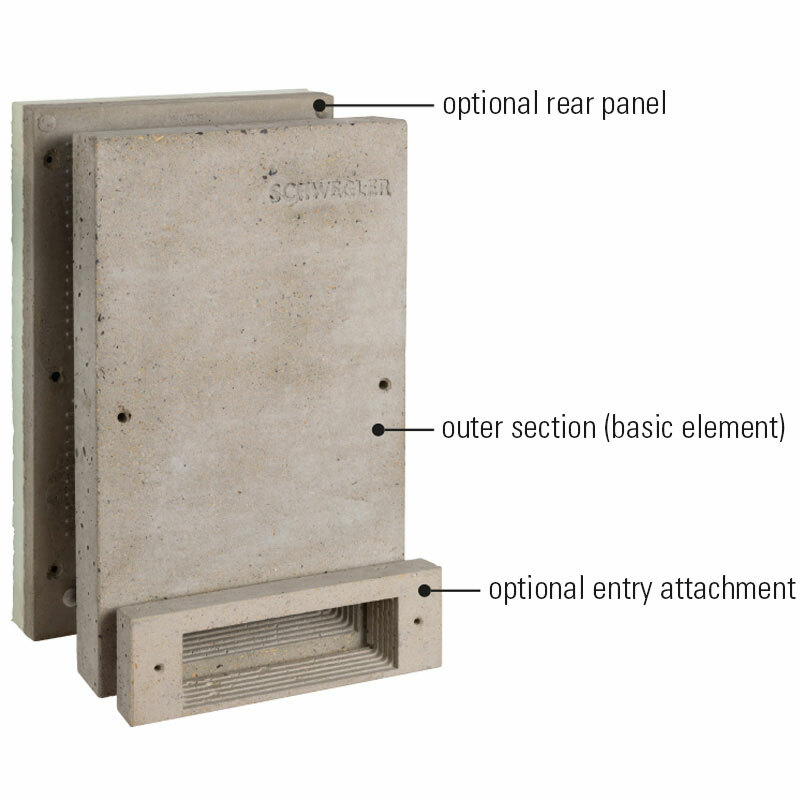 Due to the open rear, the outer section is particularly suitable for maintaining existing roosts and to make their entrance in a structurally correct way, e.g. in case of insulation measures (see Fig. 2B). The outer section can be combined with the optional insulated rear panel and/or the entry attachment (see right for description). Installation: 3 – 5 m and higher. External dimensions: W 25 x H 40 x D 5 cm. With the help of the 3FE rear panel (see Fig. 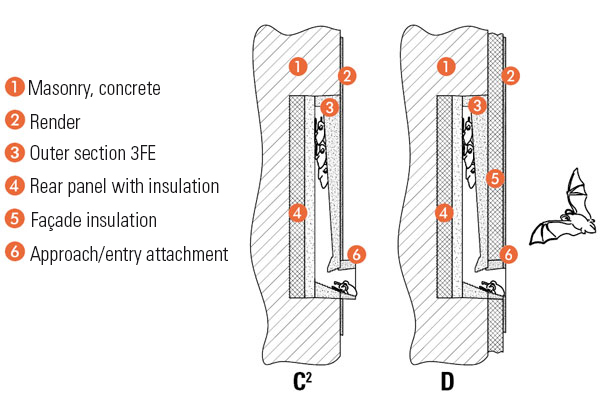 1, 2, 3, 4) a self-contained box or roost is created, the rear of which is fully insulated on the building side (30 mm rigid foam, thermal conductance λ=0.034 W/mK; total rear panel approx. 5 cm composite with λempir ≈ 0.05 W/mK). The surface of the rear panel has a special grooved structure, which enables a secure grip with good body contact. 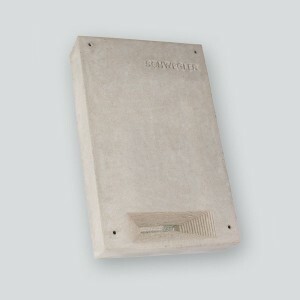 If the rear panel is used, passage into existing roosts is no longer possible. External dimensions: with outer section H 40 x W 25 x D 10 cm. The outer section and rear panel (Order No. 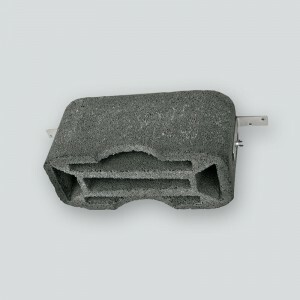 00790/2 and 00791/9) are supplied without fixing materials. Suitable for 3FE with and without rear panel. Each pack contains 2 stainless steel screws and universal wall plugs. If required, the approach/entry attachment is fixed onto the outside of the outer section using the screws supplied. It offers different functions depending on the installation option chosen (see Fig. 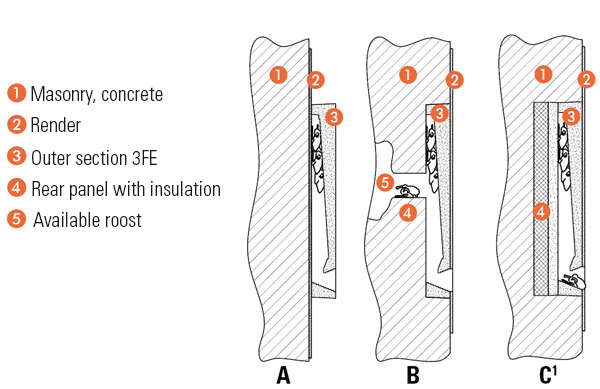 1, 3, 4) The 3 cm thick front attachment enables additional surface insulation of the roost (see Fig. 3 D). In this way an all-year or overwintering roost can be created. 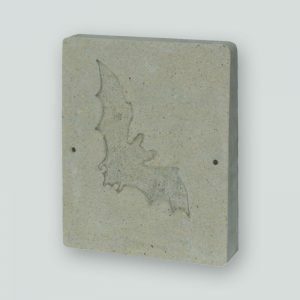 The additional insulation layer on the outside provides the bats (in Central Europe) with a frostproof hanging zone in the interior. At the same time, the thermal conductance of the whole roost also improves. A protruding entry attachment enables a drip edge and extended weather protection to be created (see Fig. 3C). This makes it difficult for heavy water running along the façade and/or driving rain to penetrate the roost. External dimensions, attachment only: H 7.7 x W 25 x D 3 cm. External dimensions with outer section: H 40 x W 25 x D 13 cm.